Due to the increasing complexity of logistics networks driven by rapid globalization and technological transformation, a naive inventory management leads to serious damage to both the business and its supply chain. Therefore, achieving and maintaining the optimal balance between cost reduction and customer service has become an important strategic concern for all types of organizations. 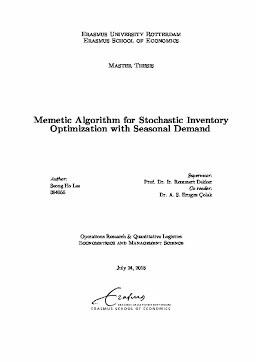 In this thesis, we study a single item, single-echelon inventory replenishment system with stochastic seasonal demand and stochastic lead time. Our objective is to ﬁnd a time-varying, periodic review (T, Rt, Qt) policy that minimizes holding, ordering, reviewing and purchasing costs under a minimum ﬁll rate constraint. We propose a simulation-based stochastic optimization framework based on a new Memetic Algorithm (MA), which combines a Genetic Algorithm (GA) with a gradient-free Local Search Algorithm (LSA). The performance of the MA has been validated by solving a benchmark experiment with 18 diﬀerent test instances and by comparing the solution quality with a benchmark model. Furthermore, its performance and robustness have been evaluated with extensive tests and numerical analyses. Our computational experiments show that the proposed MA obtains signiﬁcantly better solutions than the benchmark method and that it is robust to problem parameters and inventory structures.